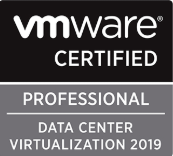 VMware is announcing a new professional certification VCP-DCV 2019. I've already blogged about the new certification changes that VMware is implementing in this blog post – VMware Certification Changes in 2019 and you could see that the passed certification will be named after the year when you met the requirement. Example VCP 6.5-DCV will become VCP 2019 and you’ll be able to choose to pass VCP exam based either on vSphere 6.5 or 6.7. VMware calls this exam officially “Professional vSphere 6.7 Exam 2019“. The VCP6.7-DCV 2019 certification will be based on 2V0-21.19 exam number and it will have 70 questions with a duration of 115 minutes. The passing score is 300 which is a traditional VMware standard. Depending on your VMware journey, whether you're renewing or starting completely new certification cycle, you can use VMware Online On-Demand Training to fulfill the requirements, VCP Vouchers to plan the exam cost, and then just need the practice and knowledge for the full success. Note: You can also use VMware learning credits or VMware learning Zone for the exam. Check out our post What Are VMware Exam Vouchers? As usual, we will plan to work on VCP6.7-DCV Study guide, but at this point in time, we're still in the early stage of the work. Make sure to check back regularly. We do, however, completed our VCP6.5-DCV Study Guide which can be used to pass VCP6.5-DCV virtualization exam and become VCP-DCV 2019 certified as well -:). If you have no VMware certification you can pass any of the required training course > Pass one of the Foundation exams > Pass one of the Professional Data Center Virtualization Exams. (VCP6.5-DCV or VCP6.7-DCV). If you're current VCP holder or holder of VCP5 or VCP6, you don't need the required training and you can go and pass the exam only. A recommended training only. You can pick either VCP6.5-DCV or VCP6.7-DCV 2019. But you have aso a choice of “Delta” exam which is shorter (40 questions only). The Exam Blueprint has some sample questions too…. Sample questions presented here are examples of the types of questions candidates may encounter and should not be used as a resource for exam preparation. Sample Question 1: The storage administrator has decided to implement NAS in a deployment. Which hardware acceleration API should be used to change the virtual disk file? Sample Question 2: A vSphere administrator has enabled vSphere Distributed Power Management (DPM) on a DRS cluster. The hosts are not entering standby mode even though there is enough available compute capacity. Which feature should be enabled to ensure DPM functions correctly? The Exam has 7 sections where each section has different Objectives. So the last section, which is section 7 has Fifteen different Objectives. But also VMware warns that not ALL section will be included in the final exam blueprint depending on the exam. VMware exam blueprint sections are now standardized to the seven sections below, some of which may NOT be included in the final exam blueprint depending on the exam. It means that the blueprint shall evolve over time so…. a change from the previous requirement of being able to upgrade within only two versions. Here is a video. Source blog post at VMware. FAQ document in PDF is here. Question: I am VCP4-DCV. Can I now upgrade directly to the new VCP-DCV 2019? A. No. The VCP4-DCV will still be inactive. If the VCP4-DCV is the most recent certification you have earned, you will need to follow the steps as a new candidate. VMware Page for the exam can be found here. If you have met the requirements (you are current VCP) so you don't need to sit a VMware class, you can also purchase the VCP Exam vouchers at the VMware online store. VCP exam vouchers may be used as payment for all VMware professional level certification exams. Make sure to check our vSphere 6.7 page and some other links below. How-to unlock the VMware VCSA root password? If you are upgrading with Delta from 6.0 to 6.5 you will get the VCP 2019 or not? I’d guess yes, but better check with VMware. Or they might put in just a delta for 6.5 > 6.7..?